Welcome to today' Friends of Sweet 'n Sassy blog hop! We have a serious list of designers on our hop today and there is no doubt you are going to be full of inspiration by the end of the hop! During the hop we're all sharing our favorite SNSS stamps, as well as some tidbits about SNSS (and maybe even Korin!) and there's no doubt that silhouette images are some of my most favorite SNSS stamps of all time! On my card today I'm using the Together Silhouettes stamp set along with new paper from the Authentique, the Lovely collection. 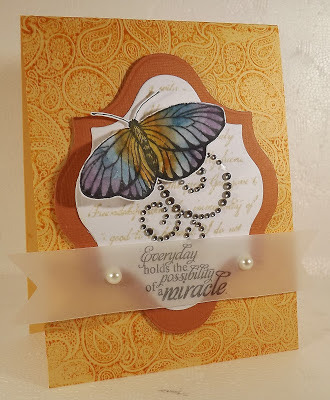 For my card, I used a plain oval die from Spellbinders, left the die on and used my blending tool and Spun Sugar Distress Ink to add some color. The I stamped the image in Fired Brick Distress Ink. I then built my card (it is like building when you have multiple layers, right?) and added a paper flower using a die from My Favorite Things. Finished off with a little bling! It's that time again...Time for this week's CAS challenge on Splitcoast. This week our challange was to be inspired by a quote from Galileo, "I have loved the stars too fondly to be fearful of the night." As soon as I read the quote I knew I needed to use my brand new stencil, Starry Starry Night, from Dylusions. 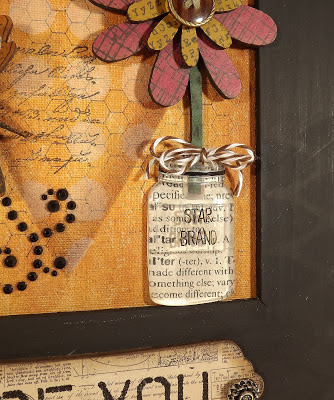 And what better product to use with the stencil then the Embossing Paste from Wendy Vecchi. I have been in a major embossing paste phase lately, I love this stuff and have been using it a lot in my art journal so why not also use it on a card! To create my card I first laid the stencil over my cardstock, applied the paste, picked up the stencil and sprinkled on a whole lot of super fine glitter! The shine is awesome! 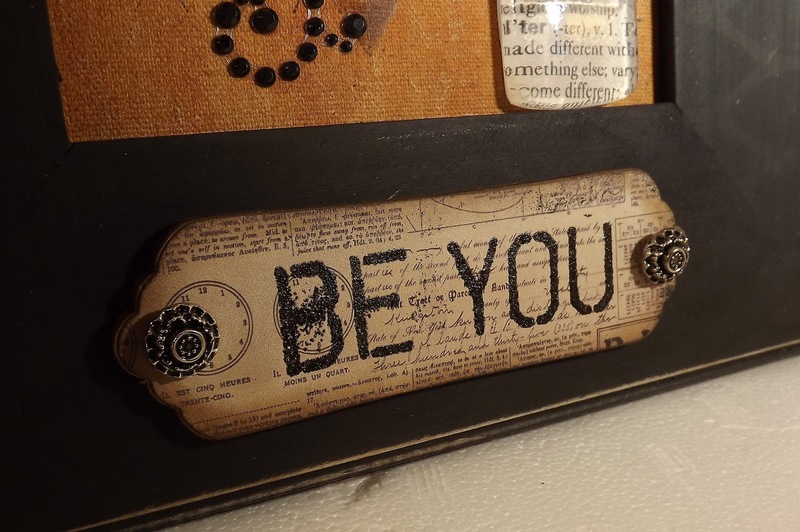 I left the paste to drive overnight and then added the sentiment (from a Tim stamp set). I didn't want to cover up those great stars so I used vellum for the sentiment and embossed the sentiment in black so it would stand out among all that shine. 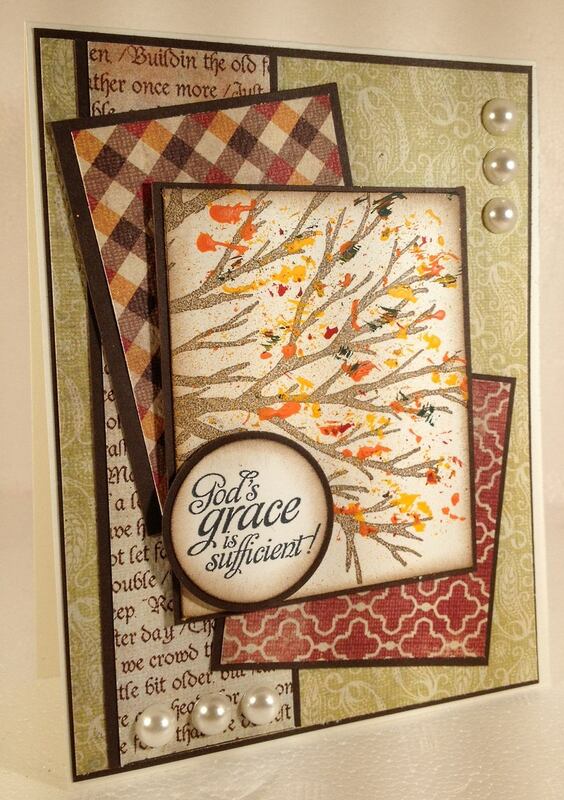 Enjoy today's card and why not try out this week's CAS challenge! Welcome to this week's CAS challenge...a color challenge using grey, tan, plum, and lavendar. And along with this week's card, I have a confession to make...I have a hard time creating cards with more than three colors! Heck, even my clothes are mostly black and white! LOL! Four colors...it makes me wee head spin! So...Instead of trying to find paper with all of this week's challenge colors, which are beautiful by the way, or create a card with punched flowers or butterflies (which I kinda wanted to do), I decided to put my many Distress Inks to good use and create this scene. I actually spied this stamp set, last year's Tim Holtz Christmas release, on my desk when I went in to make my card and this idea popped into my head. To start, I die cut a large circle for the moon and tore a piece of scap paper for the sand....then I got to work with my blending tool and inks. I first blended Milled Lavendar around the moon and then added Seedless Preserves. Once I removed the masks, I went back with Antique Linen for the sand. Then I just needed to stamp my image and sentiment. The grey was used as the card base. 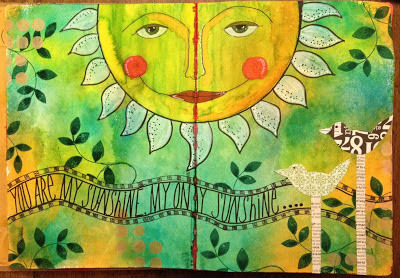 This project is my second full page (still working on finishing the first one) and it was inspired by an art piece that is in my children's bedroom that says, "You are my sunshine, my only sunshine, you make me happy when skies are grey..." That song has special significance for me as my mom used to sing it and my strongest memory of her singing it was when she was battling cancer. She lost the battle when she was just 37...I was 14 so I've carried the "tradition" of singing it to my husband and now my children. The art piece in my children's room has a sun in the middle of it and I decided that I'd like to create something that was similar that would remind me of my precious boys...who really do make me so darn happy! I started by using Dylusions Ink Sprays to color the background pages. What, you don't have Dylusions Ink Sprays? You need them...like now. They are amazing! I used Lemon Zest, Vibrant Turquoise, and and London Blue on these pages. Once the inks were dry, I went back with the Dotted Flowers stencil and added a few gold polka dots with the a paint dabber. I used a dinner plate to draw the face outline and then I free handed the face and sun beams with a pencil. Once I was happy with the drawing, I outlined everything in black sharpie. To color the face I used a paint brush and the Dylusions Ink sprays. (Dyan uses a water brush filled with the ink and I'll move to this method of applying the ink as it no doubts works better.) However, the paint brush worked well and I love that the colors kind of ran together (the ink sprays react with water, like Distress Inks) as it gave a great patina look to the face. And since I'm no ar-teest, this free form method works better for me. I colored the sun beams with a Picket Fence Distress Marker (love that thing!) Then I got busy with a white gel pen and my Sharpie to add highlights and a bit of design elements to the beams and face. Next...a space for my text and I think adding this curvy text is my favorite thing! I started by free hand drawing the lines and then using a stamp from the Further Around the Edge stamp set. Since the stamp is thin I was able to easily bend it along my curved lines for a border. Added my words and then got to work on more decorating. I used dictionary paper and decorative paper from Echo Park's Documented paper pad to add birds and the leaves are from a Papertreyink set; they're stamped in Pine Needles Distress Ink (I don't use this color enough and it's beautiful...note to self, use Pine Needles more often!). 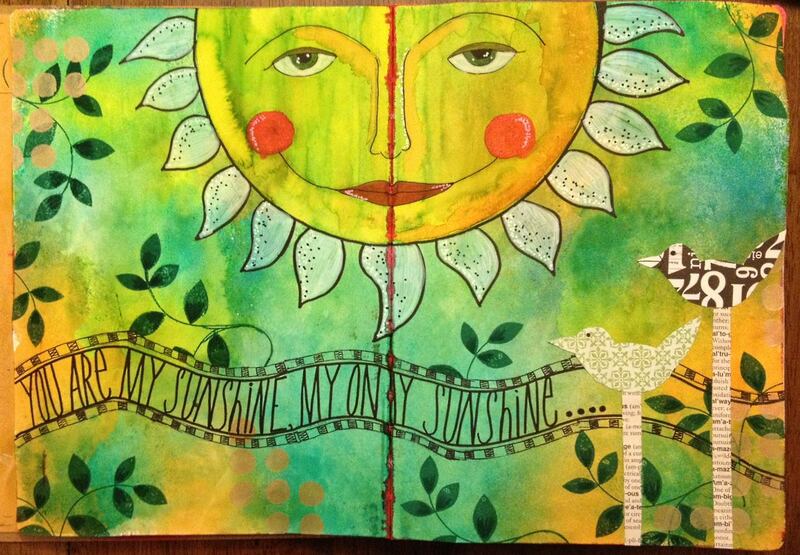 And that, my friends, is the completion of my first two-page journaling page...What do you think? Interested in this type of art? It's so much fun...the skies the limit, there are no boundries to what you can create! PS - My one painful moment and I share this so you don't make the same mistake, is that the ink does bleed through the seam of the journal. Normally this would be fine but because I used such a light color for the sun, the red from my next page really bled through in the middle of the sun. I was a wee bit sick about it when I realized my mistake but it's all good, right? You could also create on every other page to try and cut down on the bleeding. Enjoy and thanks for hanging in for this very lengthy post!! Now go out and get inky! Oh my...I'm posting twice in one week...it's a record! Running little eP sure is time consuming and my crafting time has taken a serious hit! However, I was ahead of schedule with this week's to do list so I had some time to create just for the joy of creating...love that! This card is for this week's sketch challenge over on Splitcoast. And I decided to have a little fun with paint on this card. Once my card layout was completed, using beautiful paper's from Authentique's Thankful line, I got to work on creating my tree. I used the Tree Background stamp from Sweet 'n Sassy to stamp the branches in Walnut Stain Distress Ink. Then I grabbed a few Adirondack Paint Dabbers, poured the paint on a paper plate, got an old toothbrush and went to town with creating "leaves" for the tree! I dipped the toothbrush in the paint and then pounced the toothbrush up and down on the paper to get little splotches of color. Abstract, no? Once the paint was dry I just added the sentiment, from the Amazing Grace stamp set, and a few pearl embellishemnts. What kind of projects have you created with paint? Share! And enjoy today's card! Welcome to this week's CAS (Clean and Simple) challenge over on Splitcoast. This week's challenge was a sketch challenge and I love it! I'm totally in love with banners anyway so this was perfect for me. The sketch sample provided on Splitcoast is a great example of how to use a variety of designer paper on cards but I decided to keep it all white (well...except for that bit of twine!) I used embossing folders to create four different patterns on each white banner. I also very slightly rolled up the edges of each banner to keep the card from being too flat. Then I just added some red twine and a holiday greeting, from Sweet 'n Sassy. Yippee! It's time for another Sweet Stamp Shop release! Are you all excited?! I love release day...so much fun to see all the new sets and projects created by the team members! Today I'm sharing a CAS (Clean and Simple) card using the new Get Fit stamp set. 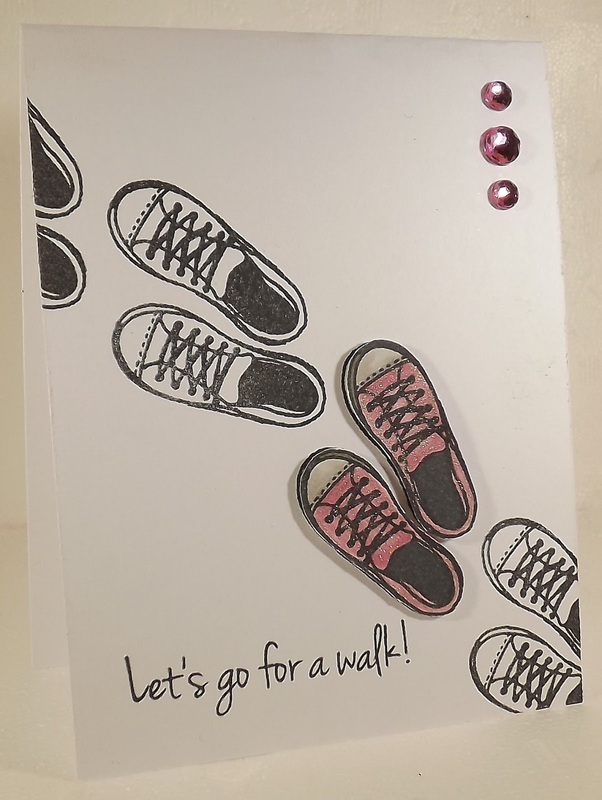 This darling stamp set comes complete with everything you need to get fit....sneakers, a scale, some healthy food, and a whole bunch of darling sentiments. When I saw this set the first thing that came to mind was footprints across my card. 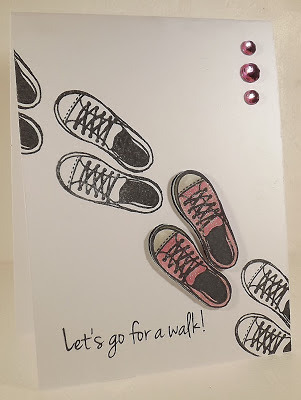 I stamped the sneakers in Memento Ink and "walked" across my card. Then I stamped the sneakers again on a scrap piece of paper, colored them with a pink marker, added some glitter, cut them out, and popped them up with foam tape (because every girl needs a pair of pink sparkly shoes!) Then I simply added the sentiment and a tiny bit of bling to one of the corners. Fun! Ready to see what the rest of the team has come up with today? Check out the links below and enjoy! Hello Monday and welcome to our next CAS challenge on Splitcoast! This week it's a photo inspiration challenge and wait until you see the photo...it's beautiful! I decided to focus on the elements of the photo...the vines in the background were recreated with an Impression Obsession background stamp in the middle of my card, my leaves were attached with foam tape, and I added scallop trim in a teal. Loved that pop of color in the photo! 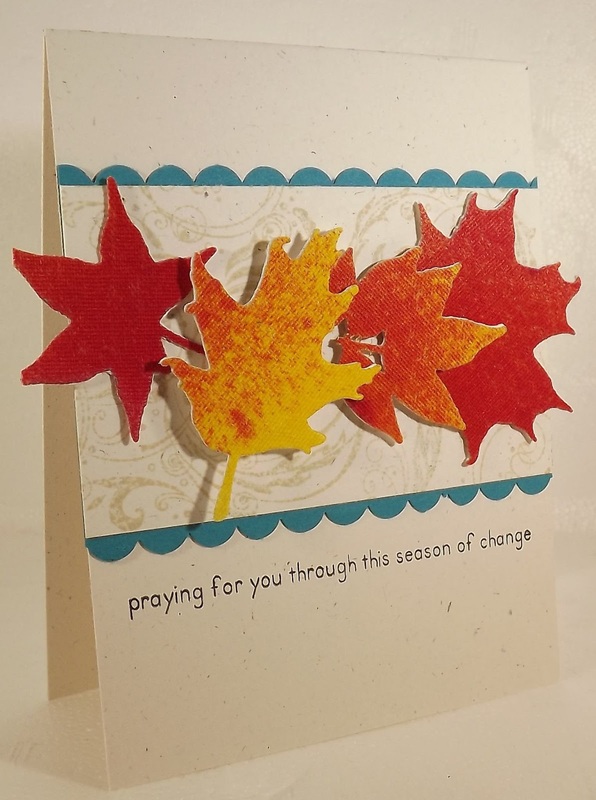 And my sentiment is also from Sweet 'n Sassy, from the Seasons of Change stamp set (this set coordinates with the dies). How exciting to be celebrating Sweet 'n Sassy's birthday! It's hard to believe Sweet 'n Sassy Sassy Stamps is celebrating five fabulous years this month and I've been with the team for three of those five years....Seriously great times, SNSS is not only one of my favorite stamp companies but Korin is one of my favorite people! :-) Time definitely flies when you're having fun and creating with Sweet 'n Sassy is full of fun! We have a lot planned this month in honor of the 5th birthday starting with today's special DT Favorites Blog Hop. The best part about this hop is that all of the sets the DT is featuring are on sale---25% off today through November 7th!!! 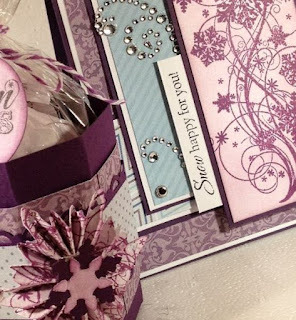 I hope you enjoy the beautiful creations shared today featuring the team's favorite Sweet 'n Sassy Stamp sets!! 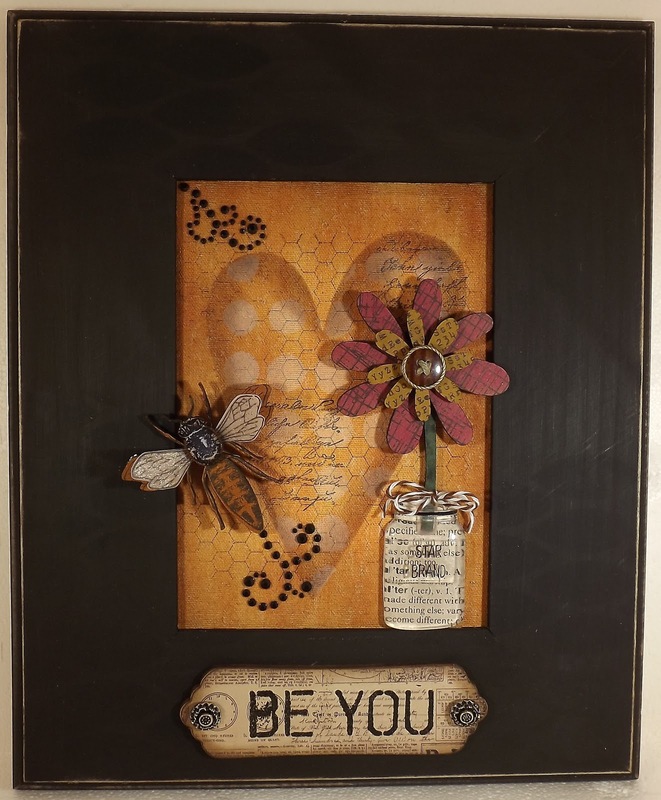 Hi everyone and welcome to our Make Art blog hop featuring art from the eTeam and special guest, Wendy Vecchi! We're delighted to have Wendy joining us today, to not only share her products but also to share in her unique artistic style and to be inspired by each of the hop participants. I started my piece by attaching a piece of sticky back canvas to chipboard, for more stability. Then I used Scattered Straw Distress Stain to paint the canvas. Since I love vintage pieces, I used my Walnut Stain Distress Ink and blending tool to add some color to the edges of the canvas. Next came decorating the canvas itself. The first step was lightly stamp the honeycomb stamp, from the Art for You stamp set, on the entire background. I pressed very gently so that some of the areas would be missing, creating that aged look. Next I used the Large Heart Stencil from Studio 490. I placed it in the center of my canvas and again used the Walnut Stain Distress Ink and a blending tool to work the color all around the heart. Loved the finished result! And then...and then...I got to play with Art Parts! I am head over heels in love with this product! Seriously heavy duty pressed chipboard pieces and you can do anything to....paint, ink, stamp on and so heavy duty that you don't have to worry about any breakage. I had a hard time not opening every package I have in stock! 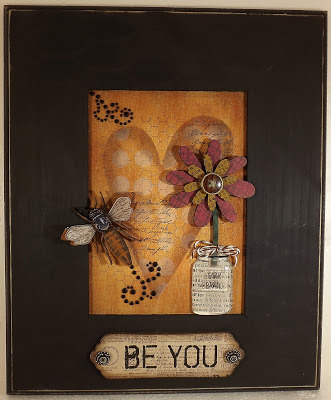 I used Florals, Bugs & Butterflies, and Sentiment Spots on my project. I used Distress Inks to color directly on to the Art Parts. Once the ink was dry, which was very quick, I used a few background stamps that I had on hand to stamp on the flowers. 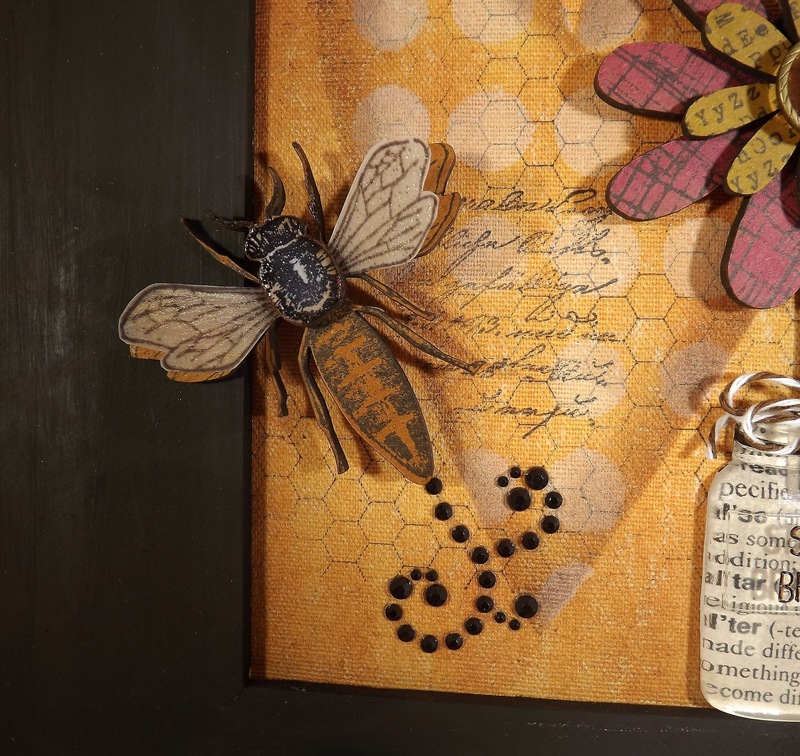 The bee, and this is the super fun part, fits perfectly with the Art for You Stamp Set! How cool is that! I stamped the bee on the coordinating Art Parts (including an extra body for some serious dimension) and then on vellum. Cut out the vellum wings and attached with a glue dot. Love the two-layer look! I even added a little glitter using a glitter pen! 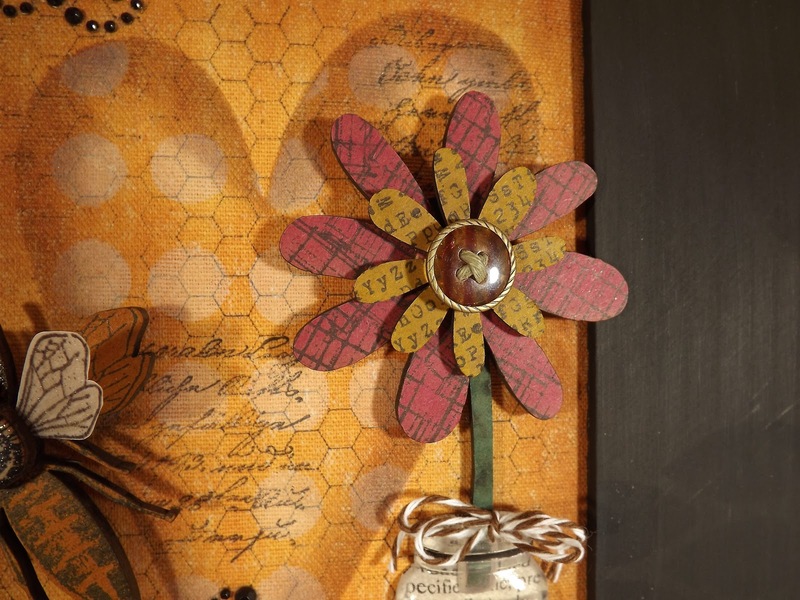 My flower got a button from the Tim Holtz Accroutements, Classic pack, along with a piece of twine and my bee received a trail of rhinestones. I used Glossy Accents to glue everything together and to the canvas and frame. Oh, the frame! It was a cheap find from my local craft store that I painted black with the Pitch Black Adirondack Paint Dabber and distressed the edges with a sanding block. Then? Blossom Bucket embellies! WooHoo! I used this darling jar to hold my flower. And guess what? The jar come with a little indentation that perfectly fits the flower stem! The jar is clear but I added a piece of dictionary paper. Wouldn't the jar be cute covered with any kind of designer paper! My last piece was the sentiment, which is also from the Art for You stamp set. I covered the Sentiment Spot Art Part with paper from Echo Park, Documented. I sanded the edges with a sanding block and aged the edges with my Walnut Stain Distress Ink. Then I stamped "Be You" in VersaMark ink and embossed with black embossing powder. The last element was to add two antique brads (cut the prongs off with Kushgrip Scissors and attach with a glue dot). I had an amazing time creating this piece and I can't wait to add it to my art wall. It's something that I created...it's part of my story. So what else is going on during our hop, besides oogling lots of beautiful artwork? Prizes and specials of course! For today's card, I used one of my fav stamp sets from Sweet 'n Sassy, Vintage Postcard. 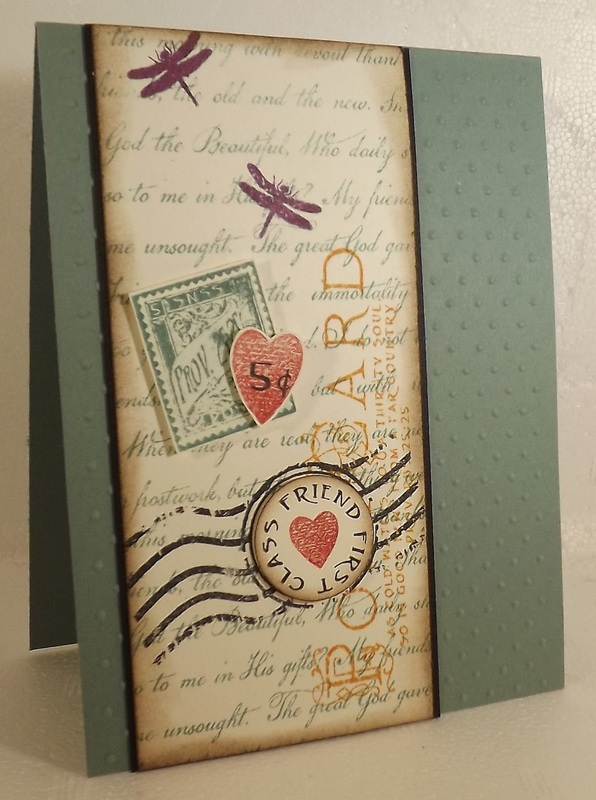 I also used the Friendship Script stamp from Sweet 'n Sassy on the background, before I stamp all those other fun images! I used Distress Inks for all of my ink colors and cardstock from Papertryink. Enjoy today's card and be sure to join us for the Make Art blog hop tomorrow! For today's card I decided to create a CAS card on...black! Most CAS cards are on white but hey, black is cool too, right? I started by layering a few Distress Stains on to white cardstock. I used white cardstock by Wplus 9 because it's super thick and able to handle the stains without warping. I then dried the stains with my heat gun and got out my Sweet 'n Sassy stamps and dies! 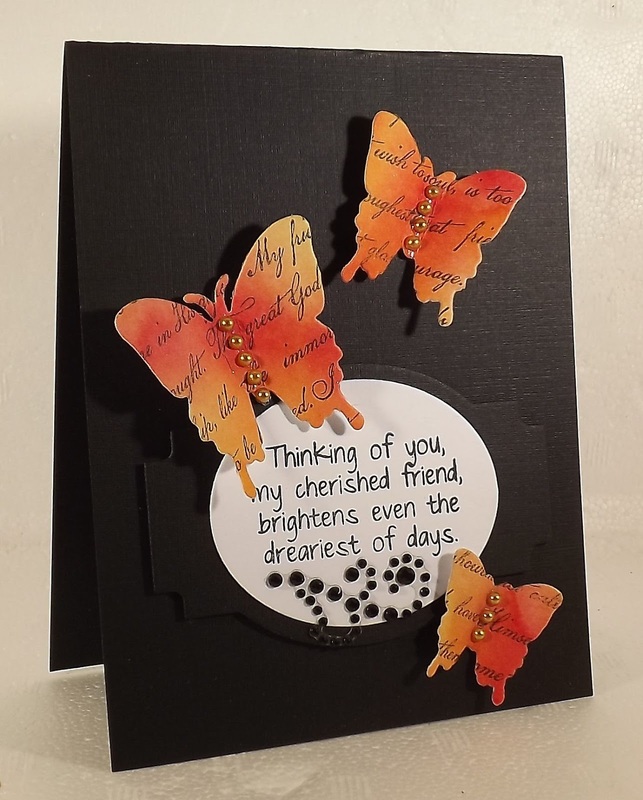 I first stamped the Friendship Script stamp on the cardstock and got busy with my fav New Beginnings Butterfly dies. Once the butterflies were cut out I added tiny gold pearls for their bodies. The sentiment is from the True Friend stamp set and I used a die from My Favorite Things, Layered Label, to frame the sentiment. Easy peasy, right? Enjoy today's card and enjoy your weekend! Welcome to day two of the Sweet Stamp Shop release day!! Have you been enjoying all the crafty goodness, showing off the great new release? I'm super excited to share my two cards with you today where I'm using a sentiment set...That's right...a set with only sentiments! Just look what you can do! 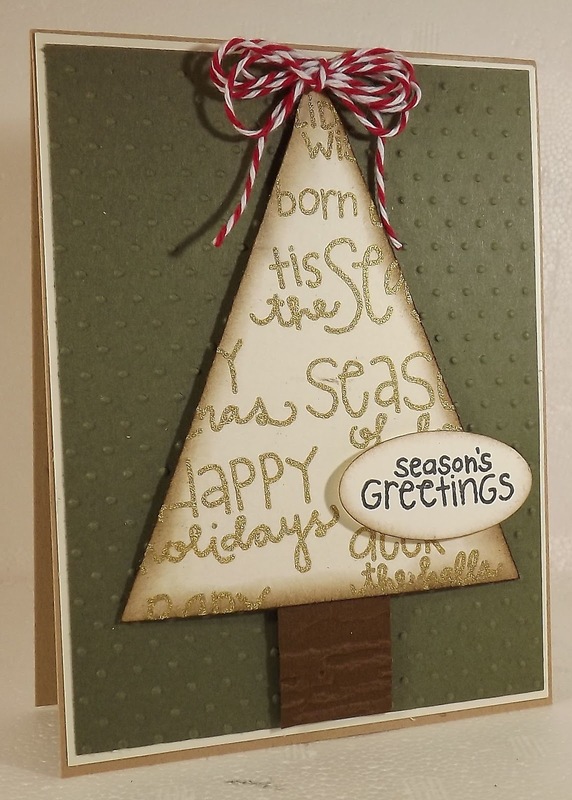 Both of these cards were created with the Holiday Sentiments stamp set. 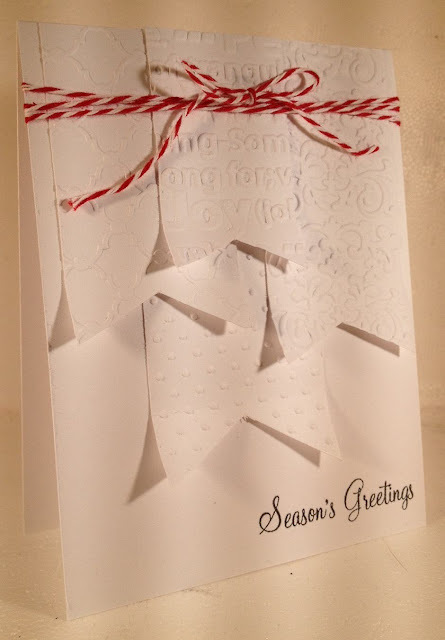 And for both cards I got a little crafty with embossing powder...why, hello my old friend! For my first card I took all of the Christmas sentiments and attached them to my stamp press, keeping them as close together as possible. Then I stamped the images on to cream cardstock, using VersaMark (or any embossing) ink. I then embossed with gold embossing powder and cut the cardstock into a tree shape (some might call this a triangle). I inked the edges with Walnut Stain Distress Ink to give the card some more depth. I then dry embossed the green background and a small piece of brown cardstock, which served as my tree trunk. A bunch of twine for a bow, and finishing touch on my tree, and then a sentiment in black, punched out and popped up on the tree, finished my card. 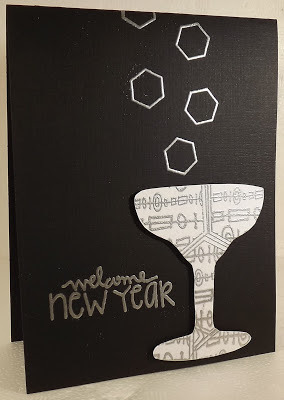 For my second card, I wanted to highlight the New Year stamp so I started by finding an online template for a champagne glass. Once that was printing and cut out of cardstock, I once again used embossing ink and one of the stamps from the Pattern Craze stamp set (love this set!) to stamp the design a few times on the glass. Then I got busy with my silver embossing powder. Once the glass was attached to the card, I stamped and embossed the sentiment, and using one of the small hexagons from the Pattern Craze set, I created champage bubbles! Super fun, right? Hi kids! It's time for another CAS (Clean and Simple) challenge over at Splitcoast! This week's challenge was to use dictionary paper. I grabbed a piece of Teresa Collins paper that I had in my stash and got busy with embossing powder and Distress Ink! I started by stamping the Damask Doilies stamp set, from Wplus9, on to the dictionary paper using VersaMark ink. I then embossed the images with clear embossing powder. Once the powder was dry I used my blending tool and Dusty Concord Distress Ink to wipe ink across the entire piece of cardstock. 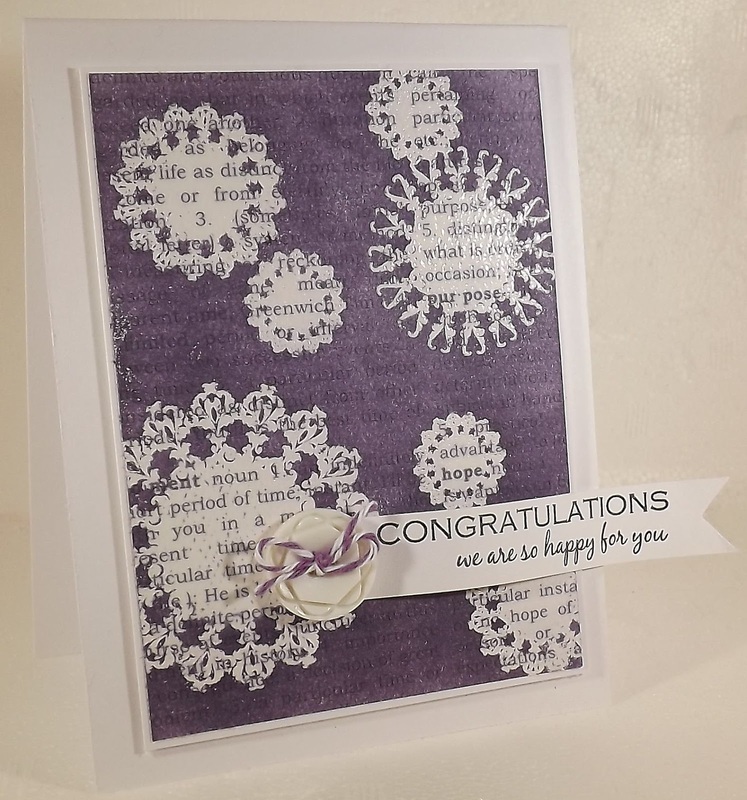 The embossing power resists the ink so that beautiful doilies come shining through! Then I just added a sentiment and a button (with a piece of Lilac twine). Enjoy and check out today's challenge! I'm showing off my very first altered journal page today on the eP blog! I used a boatload of Dylusions products on this page...and I loved it! I also included a step-by-step tutorial on how I created the page. Head on over and let me know what you think!